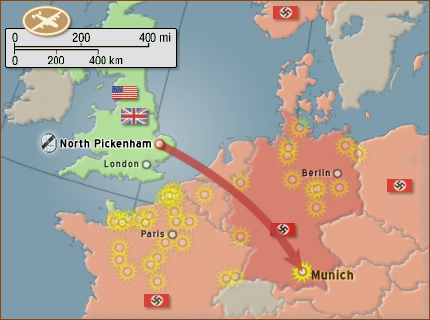 A maximun effort on Munich was issued. Multiple targets in the Big M were planned for all three bomber divisions. The 492nd drew the railroad station in the center of town. Deputy Group Commander, Lt Col Adams, led the Group while flying on board one of the Pathfinders furnished by the 44th BG. Of the 22 planes dispatched, 2 had to abort due to leaks in their oxygen systems. Although the fighter force was about a fourth less the size of the bomber force, the 492nd had good protection. Luckily, the Luftwaffe didn't make a stand at Munich. Flak was hot and heavy over Munich. The Heath Diary indicates that the dense undercast probably saved a lot of ships that day. According to reports, all 20 of the planes were able to attack the target. With that said, it's assumed that the Tracey and Platinsky Crews were able to drop their bombs before dropping out of formation. Since this was a Pathfinder-led mission, the Group blindly dropped where they were told. The results were neither observed nor graded. Platinsky Crew 816 had been reassigned to 856th Squadron. They were flying in aircraft number 42-95196. They lost at least one engine due to flak. It was determined that they couldn't reach England so they made a run for Switzerland instead. Tracey Crew 715 shared the same story. After losing an engine, they were seen limping off towards Switzerland flying in TEQUILA DAISY, number 44-40168. Both of the crippled crews made it to Switzerland. We don't know if either of the crews linked up with each other or with any of the other cripples that had to go to Switzerland. Two of the crews from the 392nd BG also had to make a run for Switzerland. We don't know if any from the 44th BG went for Swiss internment. Targeting a railroad station was inviting wholesale collateral damage, as they were filled with a larger number of civilians, including innocent women and children. From the outset of the war it was known that the Nazis had built secret high-command bunkers at the railroad stations in the major cities. Hitler was trying to use his civilians as human shields to protect his command network. Our assumption is that this was the mission's true objective for the 492nd. Bombing the train station in Munich was so important that the 492nd were sent to do it again the next day.